I have very long lashes that need discipline and that can use some volume. Needless to say, I still have not found the perfect mascara for my eyes, so I had to try Dior's Diorshow Waterproof Mascara, being the best of Sephora and all. Plus everyone is always raving about it. Well, here is another of those universally amazing products that didn't work for me. I am starting to think it must be me! Am I created differently from the rest of the women out there? Am I missing some key hormone or enzyme that metabolizes makeup? All those Sephora's voters can't be wrong, can they? These are my lashes after using Diorshow. I had to apply two coats because with just one coat I didn't get much color on the lashes. My main concern was gaining some volume, and I have to say that the mascara did just the opposite, it made them look thinner. Also my lashes curl naturally, as you can see on the lower eyelid that has no mascara at all, instead the mascara straightened them and clumped them together. It basically gave me spider legs lashes. Not cool. My friend turned me on to it - she looks amazing with it. I loved how she looked wearing it and recently purchased it. I can't say that I am sold on it for myself; however, I am willing to try it out. my eyes are like yours. asian with naturally dark and curled lashes. i'm looking for a thickening mascara. have you treid maybelline volum express turbo boost 7x before? could you try that and post pics up? cuz i heard that's the best thickening drugstore one. Hi, i'm from Chile. 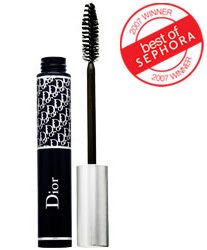 I agree with you, i got this mascara Diorshow based on the Internet opinion. I was so excited about it, but now i regreat buying it. I'm not happy with the results at all. So please don't think that you have a problem or something because i had a bad experience also. 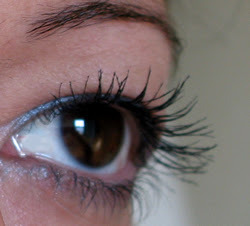 I think that the experience with the mascara depends on the person and the tipe of eyelashes that she has. But you have long and beautiful eyelashes, so, don't worry.